This page is meant to be an introduction to the field of Quasicrystals in order to educate the interested reader on some basic concepts in this relatively new branch of Crystallography. The more advanced reader may proceed to other sites and sources on quasicrystals. 1. What Are Quasicrystals ? 3. What Do We Need Tilings For ? In classical crystallography a crystal is defined as a threedimensional periodic arrangement of atoms with translational periodicity along its three principal axes. Thus it is possible to obtain an infinitely extended crystal structure by aligning building blocks called unit-cells until the space is filled up. Normal crystal structures can be described by one of the 230 space groups, which describe the rotational and translational symmetry elements present in the structure. Diffraction patterns of these normal crystals therefore show crystallographic point symmetries (belonging to one of the 11 Laue-groups). In 1984, however, Shechtman, Blech, Gratias & Cahn published a paper which marked the discovery of quasicrystals. They showed electron diffraction patterns of an Al-Mn alloy with sharp reflections and 10-fold symmetry. The whole set of diffraction patterns revealed an icosahedral symmetry of the reciprocal space. Since then many stable and meta-stable quasicrystals were found. These are often binary or ternary intermetallic alloys with aluminium as one of the constituents. The icosahedral quasicrystals form one group and the polygonal quasicrystals another (8,10,12-fold symmetry). We can state that quasicrystals are materials with perfect long-range order, but with no three-dimensional translational periodicity. The former is manifested in the occurrence of sharp diffraction spots and the latter in the presence of a non-crystallographic rotational symmetry. Since quasicrystals lost periodicity in at least one dimension it is not possible to describe them in 3D-space as easily as normal crystal structures. Thus it becomes more difficult to find mathematical formalisms for the interpretation and analysis of diffraction data. For normal crystals we can assign three integer values (Miller indices) to label the observable reflections. This is due to the three-dimensional translational periodicity of the structure. In order to assign integer indices to the diffraction intensities of quasicrystals, however, at least 5 linearly independent vectors are necessary. So we need 5 indices for polygonal quasicrystals and 6 indices for icosahedral quasicrystals. We can call them generalized Miller indices. The necessary n vectors span a nD-reciprocal space. Therefore there is also a nD-direct space in which a structure can be built that gives rise to a diffraction pattern as it is observed for quasicrystals. To put it simply we can say that in the higher-dimensional space we can describe a quasiperiodic structure as a periodic one. The actual quasiperiodic structure in the 3D-physical space can then be obtained by appropriate projection/section techniques. Thus it is enough to define a single unit cell of the nD-structure. The contents of that nD-unit cell consists of "hyperatoms" (occupation domains, ..) in analogy to the atoms in a normal unit cell. This enables us to describe the whole quasicrystal structure with a finite set of parameters. If we described it in 3D-space only, we needed thousands of atoms to obtain a representative volume segment of the whole structure as well as all parameters that go with it (eg. thousands of positions). In order to elucidate this concept with a simple example lets have a look at a 1D-"quasicrystal" in form of a Fibonacci chain, which is a quasiperiodic sequence of short (red) and long (green) segments. We embed this 1D-"quasicrystal" in a 2D-"higher dimensional space" which in this case has the form of a simple square lattice. One unit cell of the higher-dimensional space is filled yellow. The axes show the orientation of the two orthonormal subspaces Ve, Vi. The slope of Ve with respect to the 2D-lattice has to be an irrational one. In this case it is tau=1.618... The left image demonstrates the projection method, where we have a strip of projection with finite width. All points of the 2D-lattice inside this strip are projected onto the external space Ve, thus giving the quasiperiodic sequence (red,green..). The right image shows the section method in which a hyperplane (here a 1D-line) that is parallel to Ve cuts the higher-dimensional space. The occupation domains that are attached to each of the lattice points (here: bars) intersect with the hyperplane (here: line) thus producing the same quasiperiodic sequence as in the left picture. These occupation domains (here: bars) extend parallel to the internal space Vi. We can generalize this to nD cases with n=5,6,.. In that case the internal space would be (n-3)-dimensional and the occupation domains would be two-dimensional (eg.polygons) or three-dimensional (eg. polyhedra). Before quasicrystals were discovered in 1984 the british mathmatician Roger Penrose devised a way to cover a plane in a nonperiodic fashion using two different types of tiles. An example can be seen on the left. The tiles (rhombii) are arranged in a way that they obey certain matching rules. An equivalent tiling can be obtained for a 3D-arrangement. This is called a 3D-Penrose Tiling, which is made up of rhombohedrons instead of the rhombii. Such 2D and 3D-tilings have several important properties, such as the selfsimilarity, which means that any part of the tiling occurs again within a predictable area (or volume). After the discovery of quasicrystals in 1984 a close resemblance was noted between the icosahedral quasicrystal and the 3D-Penrose pattern. By putting atoms at the vertices of a 3D-Penrose pattern one can obtain a Fourier Transform which explains very well the diffraction patterns of the found Al-Mn quasicrystal. In a similar way one can use 2D-Penrose Tilings (left) to approximate a decagonal quasicrystal, which in a simple case consists of two layers with local 5-fold symmetry, which are rotated by 18 degrees so that the projection along the rotation axis gives a 10-fold symmetry. As stated above it is also possible to derive the vertices of such tilings using the nD-space approach (n>3). In this case we can obtain such a tiling by a projection of a nD periodic lattice (eg. hypercubic lattice). In short, we can regard quasiperiodic tilings as frameworks that give quasicrystal structures when filled up with atoms in an appropriate way. There is one periodic direction perpendicular to the quasiperodic layers. Below there is a simulation for a Laue pattern (X-ray) from an icosahedral quasicrystal, whereby the x-ray beam is along one of the five-fold axes. There are basically two different methods for solving the structure of quasicrystals. The first one is a 3D method, where information obtained from HRTEM images and known approximant structures is combined to obtain a realistic structure model. The second one is the so-called nD structure analysis (n>3), where the structure is modeled in terms of the contents of the nD unit cells, i.e. the occupation domains. In contrast to the 3D method this is a quantitative analysis, which allows to calculate diffraction patterns and to refine a variety of parameters by the least-squares method. It therefore allows us to use all mathematical tools that have been applied in the analysis of conventional crystals, however, extended to the nD space. This technique may include the steps listed below, assuming the application of the nD-maximum entropy method as used by YAMAMOTO et al. HRTEM images should be taken to obtain as much structural information as possible on the actual three-dimensional structure. For polygonal quasicrystals this means in particular the clarification of the cluster arrangement (in case there are basic clusters that form the whole structure). For icosahedral quasicrystals it is not possible as easily to determine cluster positions, since the high-resolution image shows only the projected structure along some direction. Information on the third spatial coordinate is therefore lost and possibly present clusters cannot accurately be associated with x, y and z-coordinates. The HRTEM images have a limited resolution in direct space so that the actual atom arrangement (distinction between atom species) within one cluster cannot be determined. Therefore an approximant structure can be helpful in giving a possible atom arrangement for some clusters, which can then be introduced into the structure model. An X-ray structure analysis for the approximant is in most cases straightforward and might even have been done before, so that already published data might be readily available. This step 1 corresponds to the above mentioned first structure solution procedure. The basis for the quasicrystal structure analysis is a single (quasi)crystal X-ray data set, usually taken on a four-circle diffractometer. (In future, however, imaging plate techniques might gain importance, since they allow rapid simultaneous measurements of many reflections including diffuse scattering intensities) The first thing to do with the measured X-ray data is to determine the exact location of the occupation domains. This can be done by using the nD Patterson method, which does not require any structure model, since only the square amplitudes of the structure factors go into the calculation. The information from the first thwo steps is then combined to obtain a first rough nD structure model. This consists of a number of occupation domains at their determined locations. The occupation domains have to be constructed in such a way that by applying the section method the observed cluster arrangement is obtained, as well as the atomic decoration of the clusters as suggested by a known approximant structure. The starting model will then be refined, in order to obtain the phases of some strongest reflections, which is necessary for the MEM calculations. After performing the MEM calculations internal space MEM maps have to be plotted. These MEM maps provide information on the presence of possibly new (additional) occupation domains. Furthermore they show in more detail the size and shape of the occupation domains and the peak heights give hints on the distribution of transition metal atoms. The information obtained from the MEM maps is then used for the modification of the nD structure model (i.e. the occupation domains). If necessary newly found ODs have to be constructed. The most difficult part is the distribution of atom species among the occupation domains. This is despite the findings in the MEM maps a trial and error procedure, due to the frequently occurring mixed occupancies. Key indicators for a structure model to be reasonable is the calculated point density and the calculated chemical composition. The constructed structure model is then refined by means of the least-squares method. The necessity of further model modifications might arise so that steps 5 and 6 have to be repeated until a satisfactory structure solution is found. The refinement should include all necessary positional, occupational and thermal parameters. After obtaining the final structure model, several structure projections need to be drawn in order to elucidate the resulting structure. Since the section method provides all atom positions in x, y and z coordinates, individual clusters can be cut out (using suitable software, such as XRSV) and plotted separately, in order to show more clearly the local structure in the clusters. For the stable quasicrystals it is possible to observe the growth morphology. Decagonal quasicrystals, such as Al-Ni-Co or Al-Mn-Pd grow as distinguished decaprismatic columns. (ten prism faces with the 10-fold axis as rotation axis).The icosahedral quasicrystals grow with triacontahedral shape (Al-Cu-Li) or with pentagon - dodecahedral morphology (face-centered icosahedral Al-Cu-Fe). The Triacontahedron exhibits 30 rhombic faces perpendicular to the 2-fold axes and the Pentagon-Dodecahedron 12 faces perpendicular to the 5-fold axes. For some icosahedral shapes see my Polyhedra applet and choose an icosahedral point group (235 or m-3-5). Comparison between Incommensurately Modulated Structures and Quasicrystalline Structures. This glossary contains explanations of some keywords that frequently occur in papers related to quasicrystals and is meant as help for the interested reader who is not familiar with these terms. An Amman grid results from a special decoration of Penrose tilings, whereby the basic tiles are decorated with line segments. In its appearance it is similar to a quasiperiodic multigrid as used in the generalized dual method (GDM). Crystalline approximants are structures which are periodic, but which are very similar to quasicrystals. Usually these approximants have very large unit cells. They play an important role in solving quasicrystal structures. They are related to quasicrystals by a phason strain or a rotation in nD space (both are equivalent). Icosahedral cluster for Frank-Kasper phases consisting of 117 atoms. A central atom (1) is enclosed by several shells of atoms, that are placed at the vertices of some polyhedra of increasing size. In successive order these are: icosahedron (12) + pentagon dodecahedron (20) + icosahedron (12) + soccer ball (60) + icosahedron (12) = 117 atoms. Structure modeling technique in which some kind of cluster is placed at the vertex positions of a 2D or 3D tiling. This is contrary to a decoration. The clusters are assumed to be columnar for polygonal quasicrystals. For icosahedral quasicrystals the clusters reflect the icosahedral symmetry, e.g. the Mackay icosahedron or the Bergman cluster. General form of IMS, which consists of two or more interacting modulated substructures. Structure modeling technique in which the basic tiles of a 2D or 3D tiling are filled up ("decorated ") with atoms to obtain a quasiperiodic structure. Equivalent tiles have the same decoration, which is not the case in the cluster model. Method which transforms enclosed areas formed by a multigrid into vertices of a quasiperiodic (or periodic) tiling. For a n-fold rotational symmetry the multigrid consists of n sets of parallel lines with equidistant spacing, which are rotated against each other by 360/n. A quasiperiodic sequence of short and long segments S and L. This can be obtained by iteratively replacing SL and L LS. (e.g. : LSLLSLSLLSLLS...). It is a 1D-analogon to quasicrystals. See dual method (DM). The difference to the DM lies in the use of quasiperiodic grids, i.e. sets of parallel lines with spacings similar to the Fibonacci sequence. tau=1/2(1+SQRT(5))=1.618... (also golden mean). In the Fibonacci chain "tau" gives the ratio of lengths between the short and long segments. It also relates to the slope of the external space (VE) towards the higher dimensional-lattice, which has to be irrational in order to insure that the projection method and the section method produce quasiperiodic arrangements. Dual of the Stampfli tiling. The double honeycomb tiling is formed by two hexagonal nets, which are rotated against each other by 30. Powerful tool for elucidating the real structure. It is of special importance for polygonal quasicrystals, since it reveals the arrangement of columnar clusters in when viewing the structure along its unique n-fold axis. Icosahedral clusters are randomly aggregated within certain rules concerning vertex-, edge- and face-sharing and the preservation of bond-orientational order. Generation of quasiperiodic tilings, by putting several primitive tiles according to local matching rules. Local isomorphism (LI) is a key feature in generating and classifying quasilattices. For a fixed orientational symmetry, fixed set of basic tiles and fixed frequency with which these tiles occur there are an infinite number of inequivalent quasilattices. Therefore the new concept of local isomorphism is introduced, which allows to group the inequivalent quasilattices into equivalence classes (LI classes). Inequivalent quasilattices are locally isomorphic if every finite arrangement of tiles in each is found in the others. 54 atom cluster with icosahedral symmetry consisting of three successive shells. These are a regular small icosahdron (Al) + large icosahedron (TM) + icosidodecahedron (Al) . A MEM map as used here is an electron density map calculated by the maximum entropy method. The key feature is a very high smoothness of the map without series truncation errors as in the Fourier map. Here we distinguish between internal and external space MEM maps. The former shows the occupation domains and the latter corresponds to the real space structure. Information theory shows that the best electron density is the one that maximizes the entropy S subject to 2, which are constraints in the form of observed intensity data. The maximization is therefore achieved by minimizing 2. In the nD-MEM the nD unit cell is pixelized by a nD grid. If there are m intervals along each basis vector we have therefore mn grid points. For each grid point the electron density is calculated, whereby the information of the whole unit cell in Fourier space is used (mn structure factors). In the case of a 5D space with 20 intervals 205=3.200.000 structure factors are calculated, which results in a high resolution in Fourier space and consequently in direct space. Set of grids which are rotated by an angle, which is defined by the desired symmetry. A grid is a set of parallel lines, which are spaced equidistantly (periodic grid) or in a Fibonacci chain-like fashion (quasiperiodic grid). The former is used in the Dual Method and the latter in the Generalized Dual Method. Also acceptance domain or hyperatom. Occupation domains (OD) can be regarded as "superatoms" in a fictitious higher-dimensional unit cell. These ODs are two-dimensional for polygonal quasicrystals and three-dimensional for icosahedral quasicrystals. Using the projection or section method these ODs create the atoms in the real space. Hereby different parts of the ODs can create different types of atoms, which means that they usually are not homogeneous but have a chemical fine-structure. The essential part in the refinement of a quasicrystal structure is to find the correct position, size, shape and chemical composition of the ODs. Their shapes are restricted by the site symmetry of their position, from which often highly symmetrical shapes arise. Two-dimensional covering of the plane in a quasiperiodic fashion using two types of tiles (skinny & fat rhombii). There are also other Penrose Tilings, such as the Generalized Penrose Tilings or the Pentagonal Penrose Tiling, which is made up of pentagons instead of rhombii. We distinguish between the linear and the random phason strain. The linear phason strain is equivalent to a rotation in nD-space (n>3). The phason strain lets the internal space (VI) unchanged, but leads to a rearrangement of tiles (so-called phason flips) in the real space (VE) and to a shifting of the reflection spot positions. The random phason strain corresponds to a random shift of the ODs along VI and can be accounted for by introducing an additional temperature factor for the internal space. Rotational part of symmetry elements without consideration of translations. There are 32 3D crystallographic point groups, of which 11 include inversion symmetry (Laue groups). Method which projects points of a fictitious higher-dimensional lattice or structure into the real physical space (3D). Material which shows diffraction patterns with rotational symmetries, that are "forbidden" by classical crystallography. The structure of quasicrystals comprises of atoms that are arranged in a nonperiodic fashion. Quasicrystal structures show long-range order, but no translational periodicity. Quasicrystal structures can be approximated by filling an appropriate quasiperiodic tiling with atoms. Tiling in which the basic tiles of a quasiperiodic tiling (2D/3D) are put together in a random fashion, thus neglecting local matching rules. The long-range orientational order, however remains due to the shape of the tiles. The diffraction patterns are therefore similar to the ones from ideal quasiperiodic tilings. The reciprocal space (also Fourier space) is a concept in crystallography which proved invaluable for the interpretation of (X-ray) diffraction patterns. While the atoms are at positions of a "direct" lattice the reflections arising from certain atom planes are at positions of the "reciprocal" lattice. Between both lattices exists a simple inverse-relationship. If the direct lattice is known we can thus easily derive the possible positions of reflections, whereas the Fourier transform of its electron density (structure) gives us the corresponding intensities. Among others this can be used for simulating diffraction patterns in order to compare them with experimentally obtained ones. Generalized projection method. The section method uses occupation domains in the higher-dimensional unit cell. All atom positions in 3D are then obtained from the intersection of the occupation domains with the 3D external space. The 230 symmetry groups with rotational and translational symmetry elements, by which normal 3D-structures are characterized. The concept of space groups is now extended to the nD space (n>3), in order to include the space groups of quasicrystals. Dual of the double honeycomb tiling. It is a tiling with dodecagonal symmetry consisting of triangles, squares and skinny rhombii. In extending crystallography, which defines 230 different 3D-space groups to a higher-dimensional crystallography, superspace groups were introduced to describe modulated structures. They are not identical with the nD space groups for quasicrystals, because of their finer classification. 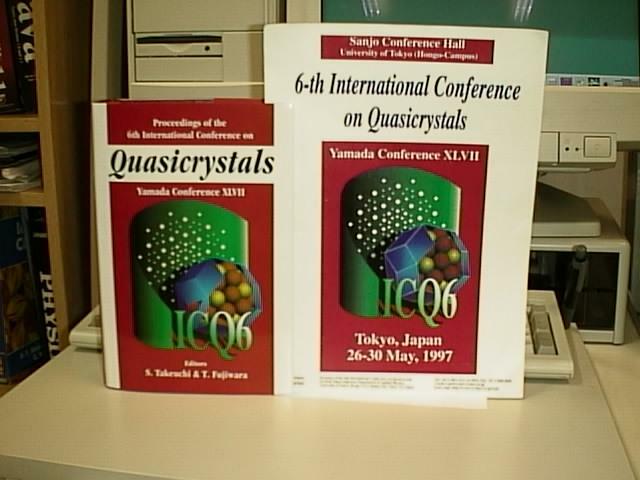 ( a satellite meeting to the "7th International Conference on Quasicrystals", September 24th/25th 1999, Stuttgart, Germany. New horizons in quasicrystals. Research and Applications. Mater. Sci. Eng. A 294-296 (2000) 1-912. Ed. U. Shmueli, Luwer Academic Publishers: Dordrecht. (2001) 486-518. QuaRef QuasiCrystal Reflection Generator (Windows 95/98/2000/NT) NEW! The book "Quasicrystals: Proceedings of the 6th International Conference" uses the design of my poster (right) for the cover illustration (left), although they don't mention that.